There is something terribly wrong in most churches, today, for they seem to promote living in the concessions that God has allowed, rather than in the will of God. People are writing to us almost every day and telling us about how badly they have been made to feel in their church because of their compassion for animals. 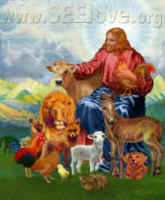 They thank us for the Christian stance we have taken to show that God loves the whole world, and not just select human beings, and that both humans and other animals have the right to enjoy the whole of creation free from suffering and abuse. They tell us about how much they mourn the loss of a companion animal, and how badly they were made to feel by their pastor and church members when they sought their comfort. All of these things are examples of the hardness of heart that exists in most of the churches, and it is totally counter to the loving, compassionate, and peacemaking teachings of Jesus. All we have to do is look at The Beatitudes to understand what we need to do to receive God’s blessings. 11 "Blessed are you when men cast insults at you, and persecute you, and say all kinds of evil against you falsely, on account of Me. 12 "Rejoice, and be glad, for your reward in heaven is great, for so they persecuted the prophets who were before you. Now we have some examples of the sharp contrast – the dichotomy – that exists in the Church, and why Mary says that the Christianity of Jesus Christ has been hijacked. With this in mind, let’s look at God’s Creation Intent.